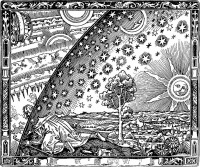 Flammarion engraving, a wood engraving by an unknown artist, so named because its first documented appearance is in Camille Flammarion's 1888 book L'atmosphère: météorologie populaire ("The Atmosphere: Popular Meteorology"). 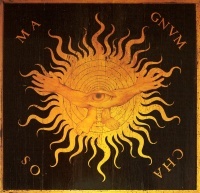 Similar terms include the cosmos, the world and nature. There are many competing theories about the ultimate fate of the universe. Physicists remain unsure about what, if anything, preceded the Big Bang. Many refuse to speculate, doubting that any information from any such prior state could ever be accessible. There are various multiverse hypotheses, in which physicists have suggested that the Universe might be one among many universes that likewise exist. Unless indicated otherwise, the text in this article is either based on Wikipedia article "Universe" or another language Wikipedia page thereof used under the terms of the GNU Free Documentation License; or on original research by Jahsonic and friends. See Art and Popular Culture's copyright notice. This page was last modified 20:12, 16 February 2014.